Today is a super fun day around here - we get to spend the afternoon at the doctor's office for our second semester scans (sidenote: you know you're pregnant when you get excited to spend hours at the doctor's office). I can't wait to see Baby Gray and watch him jump around in all of the dimensions offered while the team measures his growth and development. Today is also the day the our doctors will "officially" determine the baby's gender...you know, because I went rogue and slummed it up at a non-medical establishment to find out if we were having a boy or a girl. Won't we be surprised if they think our baby is really a she not a he! Mostly, I'll be interested to see if he looks more like a baby this time and less like a space alien. Honestly, I think the 4D ultrasounds should be reserved until the baby is a bit more human looking in order to prevent soon to be dads from yelling out their immediate thoughts when they see their sweet bundles for the first time. So, with that in mind, I'm off to gather my husband for an afternoon checking on our little Mexican Wrestler Joker! hahah that is too funny about your husband's comments =) Those ultrasounds can be pretttty iffy! Esp the 4D...I've seen some REALLY cute ones, but mine was semi frightening. Practically the only thing you could see was that she had my nose, which was really cool. 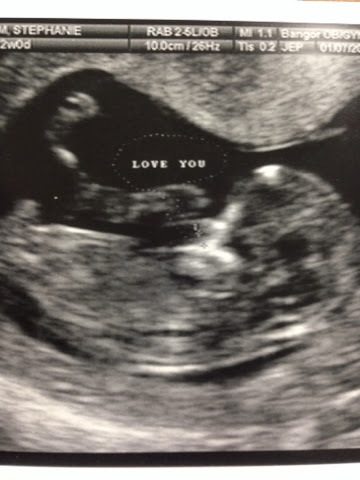 I loved when we got an extra ultrasound because she was measuring ahead, have fun at yours! Ha! I love doctor appointments when it involves baby! Minus all those pesky blood and urine samples and probably that upcoming glucose test! I'll be thinking of you and Gray today! haha love your husband's comments! Boys! Have fun at the appointment, so excited for your little family!